Long Beach, Calif. – March 12, 2014 – Formula DRIFT announced today a deal with Dailymotion to become the exclusive partner for the Formula DRIFT domestic live stream, known as the Driftstream, as well as all Video On Demand (VOD) content produced by Formula DRIFT. The Driftstream is considered to be the most widely viewed motor sports live stream in the world boasting over 1.5M unique IP’s with an average viewing time of 38 minutes. Formula DRIFT also logs hundreds of hours of VOD content per year including “Formula DRIFT Insider,” which will now stream live exclusively on Dailymotion. Formula DRIFT will be promoted widely to the Dailymotion audience, which currently generates 25M monthly unique visitors in the U.S. and 120M globally (comScore 2013). Dailymotion is one of the biggest video platforms in the world with 120 million monthly unique visitors (comScore, 2013) generating over 2.5 billion video views every month. Dailymotion is the most popular European site – across all categories – in the world according to comScore. Using the most advanced technology for both users and content creators, Dailymotion provides HD video in a fast, easy-to-use online service. Dailymotion offers a high quality user experience across all digital devices (computers, mobile devices, connected TVs and tablets) via one of the most powerful video players on the market. Dailymotion offers the best content from users, independent content creators and premium partners in the media and entertainment industries all over the world. Dailymotion provides free access to live content such as cultural events, sport competitions around the world or breaking news as it happens, and allows its users to watch free or on-demand movies, series or creative and exclusive programs from an international catalogue of tens of millions of videos. Dailymotion is available around the world in 18 different languages and 35 localized versions featuring local home pages and local content. For further information, please visit www.dailymotion.com. The 2014 Formula DRIFT season will begin with Round 1: Streets of Long Beach on April 4-5. For more information visit: www.formuladrift.com and find Formula DRIFT on Instagram @formulad, Facebook www.facebook.com/formuladrift and Twitter @FormulaD. Long Beach, Calif. – October 10, 2012 – Formula DRIFT is proud to announce Takata Racing as a premier Driftstream sponsor for Round 7: Title Fight this weekend. Takata Racing will be a premier sponsor of the Driftstream with exclusive naming rights of the final head-to-head battle and Saturday practice session. As a premier sponsor, Takata Racing will be integrated into Formula DRIFT’s Driftstream live webcast during Round 7: Title Fight beginning on Friday, Oct. 12 to Saturday, Oct. 13. For the 2013 season Takata Racing will sponsoring Formula DRIFT driver Ken Gushi in the Greddy / Hankook / Scion Racing FR-S. The Driftstream will air Friday and Saturday, October 12-13 starting at 2PM (PST) during Round 7: Title Fight, which is the conclusion of the 2012 Formula DRIFT Pro Championship season. The Driftstream is available on www.formulad.com/live. Long Beach, Calif. – April 10, 2012 – Formula DRIFT has announced today that they will continue to air all domestic Formula DRIFT rounds through the Driftstream program that will expand for the 2012 Pro Championship Season. All on track action will be shown via the Driftstream, located on formulad.com/live, including the first practice through to the last tandem competition on both Friday and Saturday event days. With an average viewership of over 150,000 unique IP’s in 2011 Formula, Formula DRIFT has signed a number of agreements that will expand the distribution of the already popular live stream. 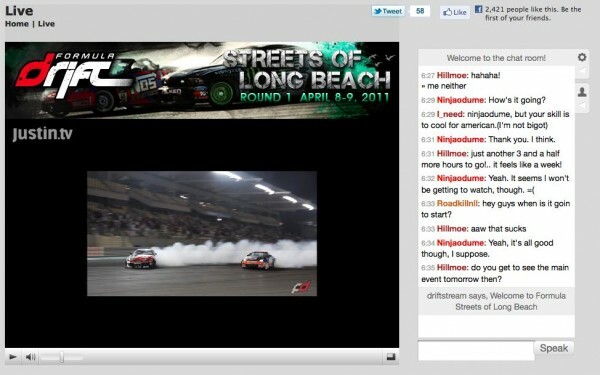 In 2012, Formula DRIFT will be distributed live through Justin.tv, Metacafe Live, Dailymotion Live and Youtube Live. Additionally, Formula DRIFT has signed a deal with Flingo, as a new “on-demand” option providing content to all Web-enabled televisions that carry the Flingo application. There are currently 10,000,000 of these devices in the U.S. and 40,000,000 world-wide and include Insignia, LG, Samsung, Vizio, Sanyo, Western Digital, as well as Netgear devices – covering more than 8.5 million screens in 118 countries worldwide. The combined viewership of all the 2012 Driftstream partners is over 200,000,000. The Formula DRIFT Driftstream begins broadcasting tomorrow at Round 1: Streets of Long Beach on April 6-7 starting at 10:00 AM (PST). Long Beach, Calif. – April 8, 2011 – After a very successful 2010 Pro Championship season and two International events for the Driftstream, Formula DRIFT will continue providing live coverage through the online platform. New features will be implemented for the 2011 season. During the 2010 season over 1,000,000 viewers tuned in to watch the live action unfold over the 7 Pro Championship events. The combined traffic for both the Formula DRIFT UAE Invitational at Yas Marina Circuit in Abu Dhabi and the Formula DRIFT Global Challenge at the Qatar Racing Club topped 95,000 in only 8 hours of on-track action. Over 1 million minutes were watched during these 2 events that aired in the United States in the early hours of the day. During the Qatar event, the Driftstream also implemented for the first time live color commentary from the 2010 Formula DRIFT champion, Chris Forsberg as he gave his expert commentary during the action and interacted with fans. The Driftstream will continue to innovate itself and will introduce new features for the 2011 Pro Championship season. GoPro cameras will be utilized to allow interaction between fans and Formula DRIFT drivers and celebrity guests. A new Facebook application will also be launched this season. The new features will debut on April 8-9 during Round 1: Streets of Long Beach. New sponsors for the season include Need for Speed, Nitto Tires, GoPro, Enkei, ACT, Kenda Tires, Motegi Racing and Mishimoto.